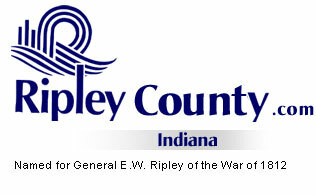 The Ripley County Council met on Tuesday, November 18th, 2003 at the Ripley County Annex in Versailles, IN. Don Dunbar, Ripley County Council President called the public meeting to order promptly at 7:00PM with Council Members Dephane Smith, Juanita Bauer, William Dramann, David C. Simon and Edward Armbrecht in attendance. Lawrence Nickell was not in attendance. This is a public meeting of the Ripley County Council. Kathryn A Wiley, acting for the Auditor, Mary Ann McCoy (at a state board of accounts meeting) took the minutes of the meeting. Council Member Armbrecht made the motion to approve the minutes of October 21st & November 14th, 2003 and seconded by Council Member Dramann. Motion approved unanimously. Fred Sagaster, Learning Network, presented Council with the option of allowing Ripley County businesses to hook into the fiber cable that has been installed to all of Ripley County Schools. Ripley County Commissioners will have to designate 5 members to a committee with Ripley County Council authorization. The requirements for members of the committee are: (1. Must be 18) (2. Reside in Ripley County ) (3. Must be bonded). Neil Comer, Ripley County Attorney will have to prepare an Ordinance. Council Member Smith made the motion to move forward seconded by Council Member Simon. Motion approved unanimously. County Attorney will prepare the Ordinance for the next Council Meeting. Judge Taul requested that the additional Appropriation of $5,000 to account#100-14700-000-020 Petit Juror for Ripley County Circuit Court to be tabled. Council Member Smith made the motion to approve the additional appropriation of $65,000 to account#203-29532-000-003 Ripley County Highway/for Bridge #180 repair costs scheduled to be completed by the end of 2003 and seconded by Council Member Simon. Motion approved six Council Members (Simon, Smith, Armbrecht, Dunbar, Bauer & Dramann) and one Council Member not present (Lawrence Nickell). Council Member Smith made the motion to approve the additional appropriation of $10,000 (to new account #) Ripley County Highway for 750N Overflow to cover expenses anticipated by the Bridge Department and seconded by Council Member Simon. Motion approved by six council members present. Council Member Smith made the motion to approve the appropriation the Ripley County Health Department (Environmental Division) Bioterrorism Grant of $18,451.00 into the following appropriations ($9,500 to Contractual Services/ $6,626 Communication Services/ $2,325 to Communication Services) and seconded by Council Member Bauer. Motion approved by six Council Members present. Council Member Armbrecht made the motion to approve the appropriation for $566,961 Edit (County Economic Development Income Tax) Council Member Simon seconded the motion. Motion approved six Council Members present. Council Member Armbrecht made the motion to approve the appropriation of #208,388.20 Riverboat Gaming Belterra and seconded by Council Member Simon. Motion approved six Council Members present. Council Member Armbrecht made the motion to approve the appropriation of $136,675.80 Riverboat Gaming Revenue/Rising Sun and seconded by Council Member Simon. Motion approved by six Council Members present. Council Member Armbrecht made the motion to approve the transfers for Ripley County Highway Department of $3,452.08 from Fund #201-25700-000-027 Garage & Motors/ $9,000 from Fund #201-28900-000-027 Gas, Oil & Lubes/ $3,000 from Fund #201-29100-000-027 Tires & Tubes to Fund #201-43100-000-027 Machinery & Equipment and seconded by Dramann. Motion approved by six Council Members present. Council Member Bauer made the motion to approve the transfers for EMS of $250.00 from Fund #100-36520-000-018 EMS Services & Charges to Fund #100-25306-000-008 EMS Director/Office Supplies and $250.00 from Fund #100-36520-000-018 EMS Services & Charges to Fund # 100-28900-000-018 EMS Director (Fuel For New Trucks) seconded by Council Member Smith. Motion approved by the six Council Members present. Council Member Armbrecht made the motion to approve the transfer for Prosecuting Attorney of $3,000 from Fund #260-34700-000-047 Bond & Insurance to Fund # 260-12402-000-047 Part time Secretary and seconded by Council Member Bauer. Motion approved by the six Council Members present. Council Member Smith made the motion to approve the transfer for Sheriff’s Department of $11,000 from Fund # 100-32330-000-014 Physician/Nurse to Fund #100-28200-000-014 Inmate Medical & Dental and seconded by Council Member Armbrecht. Motion approved by five Council Members (Armbrecht, Simon, Smith, Bauer & Dunbar) one abstaining (Dramann). Council Member Nickell not present). Council Member Armbrecht made the motion to approve the transfer for Judge Taul, Circuit Court of $750.00 From Grand Juror/Fund # 100-14701-000-020/ $1,292.00 from Copy Machine Maintenance/ Fund # 100-32301-000-020/ $856.00 from Training Fund # 100-32600-000-020/ $400.00 from Mileage Fund # 100-32700-000-020/ $5,000 from Pauper Transcript Fund #100-36800-000-020 to Fund # 100-14700-000-020 seconded by Council Member Dramann. Judge Taul withdrew the request of $2,640 from Pauper Counsel Fund # 100-32700-000-020. Motion approved unanimously. Council Member Dramann made the motion to approve the transfer of $500.00 from Meeting Fund # 100-32800-000-004 and $500.00 from Office Supplies Fund #100-25300-000-004 to Capital Outlays Fund # 100-43800-000-004 seconded by Council Member Smith. Motion approved unanimously. Daryl Caldwell of Safe Passage reported current status of the Safe Passage Project. Recommendations for the project include: 15,000 sq. ft. building with 24/7 crisis line, support groups, training, community resources, legal assistance, education, transition for clients. They are working toward more fundraisers and grants to support the facility. The goal is to have a staff of 10 by March of 2004. County Attorney , Neil Comer addressed the issue of the request to transfer $100,000 from 911 funds to EMS . It was noted that the transfer request at the lst meeting was not put into writing or officially tabled. County Attorney Comer stated that this transfer cannot be completed without the State Tax rates in place, as per Mary Ann McCoy, Ripley County Auditor. Council President Dunbar recommended recessing until Monday, November 24th, 2003 @ 7:00PM in the Commissioner’s meeting room to decide on EMS to barrow money from the Riverboat Fund until the State Tax rates have been approved. Council Member Smith made the motion to approve recessing until Monday, November 24th @ 7:00PM and seconded by Council Member Simon. Motion approved unanimously. Ginger Bradford, Ripley County Clerk, informed the council members and public that donations were being collected for Mary Stutler, Probation Department, who passed away due to an accident on Sunday, November 16, 2003 . Council Member Bauer requested if emergency Council meeting are called, to please have them at 7:00 PM to allow her to attend since she works during the day. Economic Development- Chuck Folz had nothing to report. Technology Committee-Edward Armbrecht reported GIS Mapping was discussed with no motions of approval. E911 Advisory Board-Juanita Bauer had nothing to report. SEI Regional Planning Committee-Dephane Smith reported no grants and discussed elections. Grants Committee-Donald Dunbar & Robert Reiners met with Ted Spurlock and Ed Sullivan of the Rising Sun Regional Foundation Thursday, November 13th to discuss grant applications for EMS , Map Grant, and Technology Grant for computer systems. Meeting went well. Solid Waste District-Donald Dunbar reported not enough members attended for a meeting. EMS Advisory Committee-Dephane Smith advised meeting will be held Wednesday, November 19, 2003 . Welfare Committee-William Dramann had nothing to report. Meeting was recessed until Monday, November 24th, 2003 @ 7:00PM in the Commissioner’s meeting room in the Ripley County Annex, Versailles , In. Council President, Donald Dunbar opened the meeting promptly at 7:00 PM with all Council Members present (Dunbar, Armbrecht, Simon, Dramann, Smith, Nickell and Bauer. Council President Dunbar reported that there were no minutes to read or approve. Council Member Bauer made the motion to approve the transfer of $50,000 from Fund # 100-13300-000-018 to EMS Equipment Fund # 100-36525-000-018 seconded by Council member Bauer. Motion approved by Six members (Dramann, Smith, Simon, Dunbar, Nickell and Bauer) and one opposed Armbrecht. It was noted that this was a loan until the approval of the $100,000/County General come down from the state. Council decided that the first pay for the EMS Workers would be January 19, 2004 and that money collected from the EMS runs will go to the new EMS Fund. Council decided to do additionals at the December 16th meeting for (No Tax Rate Funds) only, due to the date of December 15th being the last date that the state will receive additional appropriations. Council Members decided to have a council meeting on January 2nd, 2004 for additional appropriations advertised in December. Start date for the EMS is Sunday, 4th of January 2004. Auditor McCoy reported to the council that Soil & Water would like to have the balance of the grant given to Ripley County back at the end of the year. This was tabled to next meeting on December 16, 2003 . Council Members advised that council budgeted the total amount for (Soil & Water) with the understanding that they pay the grant in to County General. Council Member Smith made the motion to adjourn until the next regular meeting on December 16thst at 7:00PM in the Ripley County Annex, Versailles , In., seconded by Council Member Nickell. Motion approved unanimously.